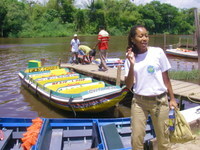 I had a wonderful adventure in Guyana recently. I went with a group of Tour Operators from Trinidad and Tobago along with a T&T Tourism Development Company (TDC) Rep and a Rep from Caribbean Airlines. 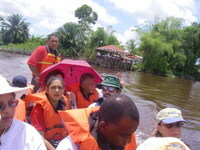 This was at the invitation of the Tourism and Hospitality Association of Guyana (THAG). Of course I went with both video camera and still camera, though these days the still shots suffer as I concentrate on filming for Earth Alert. 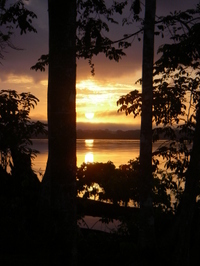 We arrived on September 1 and within the hour we were on the Demerara River having breakfast, then heading south west up a smaller river to Arrow Point and Timberhead Resorts. This took a couple hours as we were heavily loaded and we made a couple stops. Everyone first notices as you fly into Guyana is that its mostly vast jungle. Then as I got on the ground I realized it actually the Amazon with more rivers than any other place I have ever seen. 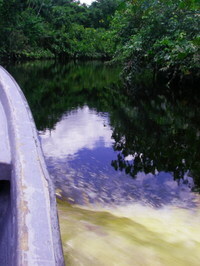 So by boat is the only way to get to certain places, and what a lovely way to get around. The waters are a lovely rich brown from all the tannins soaking out of the barks of trees. This means the water is rich in the minerals that give life to the trees , which in turn is good for us. We arrived a Timberhead first and dropped off Avion (TDC Rep seen posing - cause I asked her) and Andrew spoiling the photo, Stephen is ignoring them both - he is above that stuff - yeah right, not seen is Gunda. 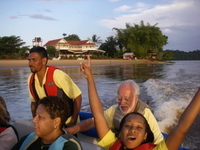 Lorraine, Elton, Alison (Carib Air), Suzan, Andy and I went to Arrow Point. 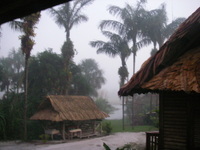 Both accommodations are made of a mixture of modern and ancient building techniques with wood and thatched roofs. There is no running water, electricity and other modern things we take for granted supplied out there. So both places make their own. When we arrived I was exhausted and was in two minds as to what to do so went for a refreshing swim and a heavy shower sent me to bed for a bit. The afternoon rewarded me with a life bird Red shouldered Macaws and lots of other great birds I already knew. That night we bagged great views of Whitetailed Nightjar. At dawn Andy, Mike (the local guide) and I headed out for some kayaking. It was lovely with the heavy mist just clearing over the wetlands and forests. As the river and forest started to close in around us I started to get good birds. The best of which soon appeared with a flash and dash of sparkling red and long wispy tails the Crimson Topaz showed off its dazzling mating rituals. As if that was not enough we also bagged Marmosets, Brown Caupchins, Bearded Sakis, Whitethroated Jacamars, Goldenthroats, Macaws and much more amazing creatures. The next day we headed back down river, caught a plane and flew Kaeiture Waterfalls. The flight took us over the Essequibo's flood plains and into the Pakaraima Mountains. 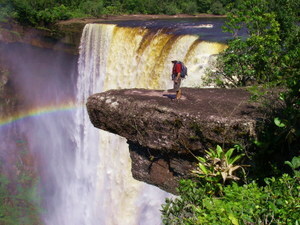 This is part of the same geological system that gave rise to Roraima and the land known as the lost world. 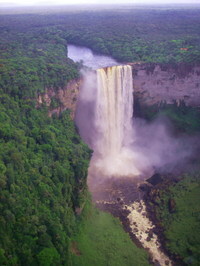 Our target was Kaeiteur Waterfalls, which boasts the world's tallest single drop at over 700 feet. I have been Angel Waterfalls, at well over 3000 feet is the world's tallest, but has tiers, though in my opinion this is splitting hairs, the fact is that both waterfalls are absolutely jaw dropping magnificent and have a strong spiritual dimension to their existence. Humbling is certainly a word that comes to mind when in the presence of these natural wonders. Again I have also been to Yoesemite National Park with my cousin Edward and its gorge is easily the most stunning I have experience, Half Dome and El Capitan are breathtaking and awesome, but it does not have anything like Kaieteur. You can get impossibly close to the top of falls; staring at the water plunging way below you is mesmerizing and one cannot help but think what it would be like to go over the falls. The lack of security railins emphasizes these feelings and its credit to the Guyanese people in keeping it natural. Fear certainly keeps one on their toes. 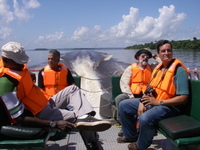 From Kaeiteur we flew down to the Essequibo and Banganara Resort where we had lunch. I immediately bagged several Pied Plovers (Lapwing) and in the haste left my hat of the plane. Green Ibis were another first for me before we had lunch. Lunch was delicious as all the food we had in Guyana was, great local delights. That afternoon Avion, Andrew, Alison and I headed over to Hurakabra (pronounce it slowly) Resort further north on the Essequibo. The owner Kit, who does not lack in character, took us first to the very aptly named Parrot Island where Orange Winged (Amazon) Parrots flew in large numbers to this island in the river. A very impressive sight thats far more noisy than our Scarlet Ibis roost. I love Parrots because they are like Kit - not lacking in character. On arrival at Hurakabra Gem, Kit's lovely wife, showed us Jaguar paw prints in the sand mere feet from our door and in the middle of where we were to have dinner. Avion got super excited about this and she, Andrew and I shared turns looking for a Jaguar return that night but all we got was lost sleep. The next morning I was up before dawn as usual and went birding, the lifer I got was the White throated Toucan (Red billed Toucan) along with Amazon Kingfisher and Red and Green Macaws, which is the second time I have seen these amazing birds and I just love them, their colour, character and flair is just spectacular. From here we went by power boat and by van to Mainstay Resort, which is located on a lake, unfortunately all their kayaks and other equipment is being replaced at the moment so I could not go kayaking. A pity because the birding on the other side of the lake looked wonderful for exploring. I tried to sleep in a bit but my body's internal birding alarm clock went off and I went birding at 5:30am, thankfully I was rewarded with Brown throated Parakeet and Common Toddy excellent birds, I also had my first views of a Common Potoo in flight, I first thought it was a Night Hawk with a long tail. On the way out I had a bat Falcon sitting in a tree right next to the road. Oh and this is Avion posing, I actually promissed her I would not put up this shot but I just could not resist, sorry Avion. I am now reading this. Thanks for the write-up. We look forward to having you back to Guyana for more adventures. I love the images you have. I can't wait to see the videos. Next time we will take you guys down south so you can see our wide open spaces backdropped by our mountain ranges. I know it's been almost a year now since we hosted you and your fellow members in Guyana on a mini FAM trip, but I am now reading for the first time the blog you posted along with the pics and I couldn't have said it better even though I live here and see it everyday. THANK YOU. I wanted to say I had endless fun on the FAM trip you all hosted in return and will definitely be coming back to POS with a group soon. I love your blog, your site is also wonderful. I cannot wait to visit. 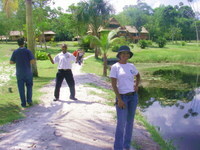 I know it's been almost a year now since we hosted you and your fellow members in Guyana on a mini FAM trip. Great another adventure blog, I wonder what destination we will be reading about this time. Never been to the place but given the chance I would definitely go there. I am an adventurous type of guy so going on adventure trips is no biggie for me. I have been to a lot of nice place, each with its own specific landmarks. What an amazing pics, looks fabulous, but If this is about ships trips I prefer to visit Guyana and practice rafting there, 'cause a friend of mine told me that there is an amazing place for that. Of course, I went with two video cameras and camera, although these days the shooting continue to suffer as I concentrate on shooting the Earth Alert. I had been also a great experience of lion safari in shshan gir(Gujarat-India), You show a lion TV but if you see them in jungle It was a great experience, Kings are always king. I figure out it should be a terrific adventure specially seeing that amazing downfall, I'd take a lot of photos there.